6 days til our team disperses for 2 months to Canada/Europe for competitions. Today also marks the 4th day back on the ice for Brian...who, for those that don't know, broke his foot around New Years Day and has been making his comeback, hoping to still compete at World Cups in Hamar-which is in 2 weeks...amazing! Ha, our group just never ceases to live a 'normal' life because there's always obstacles (tired legs, broken bones, torn hamstring), but what stems from overcoming obstacles are lessons you learn that develop integrity. And living a life of integrity is a life of which to be proud. "Far better it is to dare mighty things, to win glorious triumphs even though checkered by failures, than to take rank with those poor souls who neither enjoy nor suffer much because they live in the gray twilight that knows not victory nor defeat." Sports...they make us set goals, push our bodies to their absolute limits, teach us life lessons, strengthen our faith and give us opportunities to be role models to those around and those coming after us. They are fun, challenging, painful, victorious, disappointing, they are a life style, a career...sports boosts confidence, develops character, tests integrity. 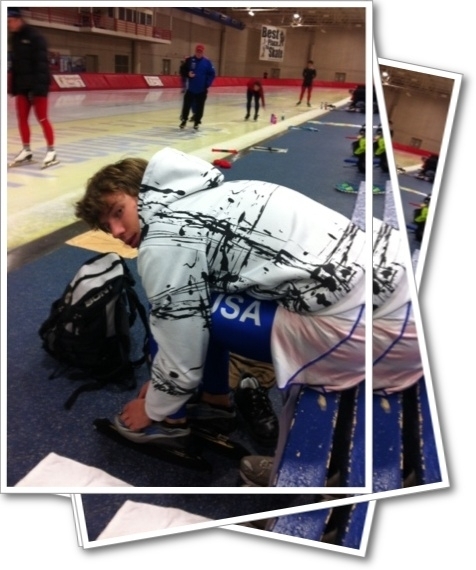 Jeffrey and I weren't the most avid speedskaters when we were young. Jeffrey liked speedskating more than I did, but we both enjoyed many other sports from swimming to tae kwon do to baseball, tennis and more. Our parents were not biased to sport. We sang in the church choirs, played the violin, learned piano, and had voice lessons. Mom didn't want to force us into the sport she succeeded in, but consciously sought opportunities for us to find what we loved, whether it was a sport or not. For some reason though, we kept being drawn back into speedskating. 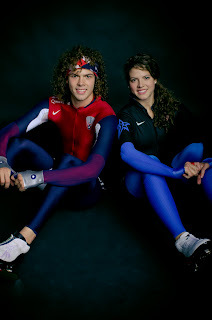 Since this past summer of 2011, Jeffrey and I began training together with mom as our coach and eyes set on the Olympic rings of 2014. With this decision, we've wanted to collaborate together on a website that would illustrate our journey together, as a blog and a place to find info about us under the tabs/pages links! We will post pictures, videos, updates and anything else that will help immerse followers in our speedskating adventures! Again, we can't thank enough all of our sponsors (check out our support tab!) and friends, who've contributed to our dream, as we continue to train and compete as well as use our platform to share our faith in Christ. We couldn't do it without you and we want you to have fun being a part of this journey. Please know that you're a big help to making Olympic dreams come true! As our first blog post, we hope you are interested to see how we'll work towards the 2014 Olympics over the next two years and will regularly check back for daily/weekly updates on our journey!